In accordance with the cinematic drought commonly known as February, these are some of my favorite 2014 releases that were generally neglected by the Oscars—and are well worth a first—or second—look. There’s plenty of action in Guardians of the Galaxy, the latest Marvel cash cow to enter the multiplexes, but what might really win you over is the lighthearted, often funny nature of the enterprise. When I first began making films as a producer 15 years ago, we did everything by the book. The script was completed before we even sent out a casting call. We cast out of a lovely spacious conference room in an agent’s office. The sides were beautifully printed and stapled, there were cookies and drinks in the waiting area. We had call backs, we held several rehearsals, pause for effect, and spent time on costume, shot lists, hiring equipment and so on. In short, we were very prepared.... The film was well executed and apart from some sound equipment malfunctions and therefore reshoots, which can happen on the biggest of movies, everything was perfect! This was pre-Youtube, so the film ended up being seen by very few and the cut was certainly effected by the sound issue, but it was otherwise very successful. At least it was completed to our own extreme satisfaction. As a first attempt at filmmaking it was pretty amazing to be honest, especially as we were shooting on the first consumer quality 3 chip DV camera. So to those of us who were involved in the project, it was a complete success, and the more I make films and are involved other peoples as well as my own projects, I appreciate exactly what made that first one so successful to us. We decided it was a success because our expectations and our minds were very open, we just wanted to make a film from an idea that we had, and we wanted it to be as good as we knew it could be. We succeeded. I think it is very important to be very clear from the beginning about what you think success is when it comes to your own project. The definition of success varies wildly from person to person, and so it follows that what makes a film successful can and should be unique to you and your film. But what makes a very independent film successful? To some it may be accolades, film festival awards, huge responses from friend and family etc, and to others it might simply be a completed cut. It is really worth spending some time thinking about what you actually expect from your foray into filmmaking, realistically, because it that expectation will surely lie somewhere between Sundance and forgetting to press the record button. Even if all that thinking only accomplishes the lowering of your stress levels, its well worth the effort I can assure you, especially if you are fledgling filmmaker. Here are a few mantra’s I have used over the years to keep me calm, with varying degrees of success. “Lets make a film and learn a lot from the process”. The last one is my current favorite, but all of them and whatever else you make up for yourself will help to put things in perspective, or keep you honest. There does have to be a sense of balance, after all we don’t have anyone breathing down our necks asking for our first cut or demanding to know why we are over budget already. Because along with the freedom that being an independent filmmaker allows, the joy that comes with no budget, no investors and no management, the bliss of working without any kind of pressure at all from anyone else, comes the very real danger that this same freedom you cherish will mean you will never finish shooting the film, let alone editing it. Quite ridiculously and conversely, the best way I have found to work has always been under some kind of time pressure or stress, even if self inflicted. In the case of very independent filmmaking, this pressure must be set by us, the filmmakers. Setting ourselves the very clear boundaries of time, subject and film length is absolutely why we were able to make 52 films in as many weeks and finish them all in 2011. Even if we would recut some of them now, or make adjustments to sound or whatever, because lets face it, lot of filmmakers would change things in retrospect, even with money. But more scenes and more options isn’t always the best route to a good film or a completed film and a good completed film is, after all, what we are all hoping to achieve. We are at the beginning of a new year, in case you hadn’t noticed, and I think it’s very important to remember that the last one seemed to go by disturbingly quickly, and while I remember some of it, I do think that I must have been tranquilized for a good deal of it otherwise why are we in 2013 already... That said, I have no intention of skipping through large chunks of 2013 like some okay movie we have seen a hundred times, fast forwarding through it only because we but feel compelled to watch again and again the one or two scenes we quite like. Or maybe that just a quirk unique to me. No, in 2013 I will wring the potential out of every single second with my own bare hands if I have to...or something to that effect. I am loathe to make New Year resolutions because, along with everyone else I know, I can never keep them. But it doesn't hurt to write things down at this time of year or any other for that matter, so as to remember to actually do them eventually... or at some point in the near future. After all once you set your foot on the road of filmmaking, and by that involve others on your journey, you do have an obligation to those ‘others’, certainly, and at the very least to not waste their time on something that will never see the light of day. It is very easy to feel completely overwhelmed and underfunded when you do, as you undoubtably will, compare yourself to both the commercial and Independent worlds of filmmaking. But please try to free yourself of this terrible burden of comparison, it’s a completely pointless exercise and will only make you never begin anything. Don’t worry if the idea for a film that you have held close to your breast since 9th grade has been already made, never saw general release and is now on Netflix, you are not trying to compete with studio or even independently financed films anyway. There is very little original film, in fact, even when you examine the films released that aren't remakes or sequels, almost all of them are adaptations of books at the very least. It’s very rare for a film to be green-lit that doesnt have a built in audience these days, sadly. Whether that is from bestselling novels, previous incantations, video games, or whatever. I am almost certain that there is a studio executive right now trying to figure out a way to make a movie out of a phone app.....Even though independent films are far more often original screen plays than the big studio films, just because a screenplay is original doesn’t mean the ideas behind it are. Think about it, when was the last time you saw a film and remarked at the end of it “wow, I have never seen anything like that before”......my point entirely. So don’t worry about whether or not your idea for a film is the most original idea on the planet, if you write it, create the characters that live it, hire the actors that bring it to life and shoot it in your own style it will be unique and new. The hardest thing to do is to begin. If it’s safe in your head then you can never fail, you won’t doubt yourself or your choices, or heaven forbid have to suffer the doubt of others. Anyone who has ever done anything even remotely artistic, from writing War and Peace to painting the bathroom ceiling knows this. So to begin, to write the script, to find the locations and to realize that you can actually do this is hard to do, but you must. Even if your beginning is simply to name a new folder on your desktop and open up a document, name that and save it to that folder, something I do with every idea I have, its a start, and then it actually exists in the world. Once it exists you will feel obliged to at least visit it from time to time, if only out of politeness, and you’ll be surprised how quickly, with each visit, something begins to form. At a certain point that little folder on your desktop will be bulging with creativity and you will too! Maybe for you the feelings of success you will get from all this work will so invigorate the project that it will take on a life of its own and before you know it you will be shouting ‘Action!’ to a very confused looking flock of pigeons at the park or, more hopefully, a small group of inspired and enthusiastic fellow artists on your first day of filming. Creating something, anything, is to me a success, in whatever form it takes. It’s hard enough to get through each day without bumping into things, so making something that begins in your own imagination, and then taking that something out of your head and putting it out into the world is miraculous and life changing, with luck not just for you either. And if what you then create, your film, feels completed to you, if it feels like ‘your’s’ and you love it, then isn’t that success? Not every film that every ‘big’ filmmaker with a budget makes is successful, not to them and not on every level. Very independent films are bound to run into far more road blocks in production than big studio or pseudo independent films, but I always believe truly and deeply, that if a film gets made, and gets seen, even by just a few lucky people, then that is the true mark of success. 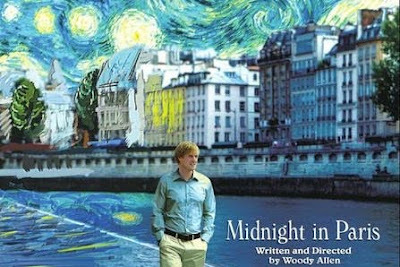 Woody Allen’s Midnight in Paris opens with a montage of the wonders of Paris set to Sydney Bechet’s music, and while it doesn’t have quite the same impact as the New York-Gershwin fanfare that opens Manhattan–it does make you want to book that coach ticket (who can afford first class–heck, who can afford coach?) to France and wander the same cobblestone boulevards while savoring a baguette. And the movie itself? Well, its really rather enjoyable, a light, attractive fable about Americans in Paris. Established Hollywood screenwriter (and implied hack) Owen Wilson is trying to finish his first novel (art!) while dealing with his frustrated fiancee (Rachel McAdams) who wants to both subject him to some seriously overpriced shopping sprees with her supremely snobbish mother and explore the sights in the company of her pedantic American friend (Michael Sheen). Don’t get your hopes up too much with this Tall, Dark Stranger--–while this latest effort from the prolific occasional expatriate is a vast improvement over Whatever Works, it’s still a minor entry in the Woody Allen oeuvre. The assorted characters in this London-based opus are all in the midst of questioning their life choices or in the aftermath of having made some poor ones. Anthony Hopkins has left his wife to marry a much younger female who enjoys “the good life,” one which Hopkins is hardpressed to supply-- either financially or physically. Meanwhile Hopkins’ daughter Naomi Watts is unhappily married to a creatively stalled author (Josh Brolin) who has his eye on the comely–and engaged-- lass across the way (Frida Pinto). While all this is going on, Hopkins’ ex-wife Gemma Jones) has been consulting a psychic who leads Jones on the path to emotional and spiritual fulfilment–even if it means tossing a few curve balls in the process.